If you drive through a neighborhood that is currently undergoing construction in the Atlanta area at dusk, you will notice something about the model homes. They are all lit up! Not only are the exterior features of the homes lit, but the walkways and landscaping is also lit up to show it off to potential customers. This is visually stimulating and often provides stunning results that provide great curb appeal. This extra light really enhances the homes exterior features and makes the vibrant colors of the landscaping pop out even after nightfall. 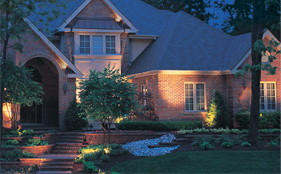 Add a little night time curb appeal to your home with outdoor lighting enhancements that are strategically placed to make your home shine. In addition to providing breathtaking views of your home after dark, our lighting enhancements also offer added safety and security. Lighting enhancements on sidewalks, paths, decks, and around pool areas, are helpful in allowing individuals the added advantage of sight at night without having to turn on overbearing flood lights. Furthermore, lighting up the outdoors will help reduce security risks. Take a look at just a few samples of our work we have done in providing outdoor lighting enhancements that are tasteful and seamlessly flow with the outdoor environments that they enhance. If you are interested in adding a little illumination to your outdoor areas, call our Woodstock landscaping design office today at 770-924-1001 or contact us using our Schedule a Consultation button.